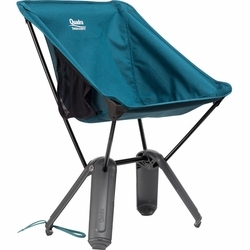 Therm-a-Rest Quadra Chair. Introducing the deluxe Quadra Chair—big chair comfort in a small, easy-stow package. Weighing in at just 2 lbs 14 oz (1318 g), the strong and sturdy Quadra can accommodate up to 300 lbs (136 kg) while offering the height and depth of a much larger chair. It sets up in a flash and the mesh side pocket is the perfect storage spot for a book, phone or beverage. And when it’s time to hit the trail, it packs right up into its own base. Genius!